To Cite: Boudaya M, Mlika M, Chaari Z, Zribi H, Aouadi S, et al. Chest Wall Hydatidosis: A Single Institution Experience, Arch Clin Infect Dis. 2016 ; 11(4):e35134. doi: 10.5812/archcid.35134. Background: Hydatidosis is an infectious disease resulting from the development of the larval form of the parasite Echinococcus granulosus in humans. The invasion of the chest wall by echinococcosis is rarely described. Methods: The current study reported all cases of chest wall hydatidosis treated in the department of cardiothoracic surgery from January 1990 to December 2011. Results: The mean age of the patients was 41.3 ± 16.8 years. Males and females were equally affected. The cysts mostly were located at ribs (13 cases) and ribs with vertebrae (10 cases). The chest wall muscles, the sub-cutaneous tissue and the sternum were involved in four, three and two cases, respectively. A costal resection was performed in 13 cases (one to three ribs; mean, 1.5 ribs) and a costovertebral resection was performed in 10 cases (transverse process three, vertebral body four and both three). The other surgical procedures were partial resection of the sternum (two cases) and cystectomy with resection of parietal soft tissue (nine cases). The outcome was favorable for 29 patients. A recurrence was observed in two patients who presented costovertebral and sternal involvements. Conclusions: The chest wall localization of the hydatid cyst is rare. In the costovertebral involvements, this parasitic disease behaves locally as a bone malignancy. The treatment is surgical and the resection should be large and radical to avoid recurrences. Hydatidosis is an infectious disease resulting from the development of the larval form of the parasite Echinococcus granulosus in humans. This parasite is very common in the Mediterranean basin, Australia and South America. Its incidence in Tunisia is about 15.1/100,000 inhabitants (1). In humans, the accidental hosts of the parasite, the most common site of localization is the liver, followed by the lungs. Other primitive extra hepatic and extra pulmonary hydatidosis are rare (2-4). The invasion of the chest wall, defined by the attempt of the ribs, the vertebrae, the intercostal muscles and the soft tissue by echinococcosis, is rarely studied. The current report aimed to describe a 21-year-experience of hospital department on the prevalence of hydatid cysts from January 1990 to December 2011. The current retrospective study evaluated 32 patients who underwent surgery for chest wall hydatidosis diagnosed or confirmed in the department of cardiothoracic surgery from a pathology reporting system from January 1990 to December 2011. 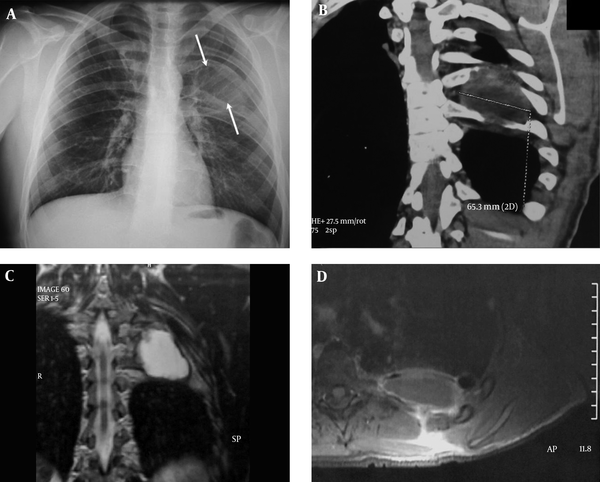 This report deals with the clinical, pathological, therapeutic, surgical features and the treatment results of the chest wall hydatid disease observed in the total number of patients. The inclusion criteria were the presence of E. granulosus in one of these components of chest wall: the outer margins of the thorax containing skin, deep fascia, thoracic vertebrae, ribs, sternum and muscles or an association of the different sites of localization. The patients were excluded from the study with lung hydatidosis, mediastinal, cardiac or diaphragmatic cysts without a chest wall invasion. The recorded clinical information included demographics, geographical origins, medical history, the notion of chest hydatid surgery, recurrence period, clinical symptoms and anatomical location. To complete the clinical exam and know the prevalence of the disease, the pathological state was assigned based on results of the chest radiography and/or computed tomography (CT) scan, thoracic ultrasound examination (to explore the soft tissue) and magnetic resonance imaging (MRI) findings if available. Almost all patients had chest X-ray (97%), a radiological image in favor of osteolysis was observed in 13 cases (40.6%). The exploration was completed by a CT scan in 25 cases (78%), with thoracic ultrasound in 24 cases if the mass was superficial and accessible. An MRI thoracic exploration was performed in 11 cases (34%) to evaluate spinal or intra ductal extension mainly if the images on CT scan showed a possible local extension of the parasite to the vertebrae or complex images. If a costal and/or vertebral development of the cyst was suspected, it was tried to specify the location of the affected area, the level and the total number of reached vertebrae/ribs. Hydatid serology was performed according to enzyme-linked immunosorbent assay (ELISA). Five patients (15.6%) underwent hydatid serology which revealed a positive result in all cases. The diagnostic procedures were carried out in the department of pathology. Parasitological confirmation was not performed since according to epidemiologic findings in Tunisia, the only species of echinococcosis is Echinococcus granulosus. The surgical access, the operative aspect of the cyst (mono vesicular, multi-vesicular, multiple locations, or complicated cyst: ruptured or infected) and the possible collaboration with an additional team (orthopedists) were specified in all patients. Posterolateral thoracotomy was routinely used. An incision in the fifth or sixth intercostal space was accomplished with the patient under general anesthesia and in the lateral decubitus position. Different interventions are generally made with a selective intubation. Other surgical accesses are used according to the hydatid location or its eventual extension (particularly in case of spinal surgery). After the identification of the cyst, it is surrounded by scolicidal solution impregnated gauze to prevent seeding of possible daughter cysts or other hydatid material. Uncomplicated giant cysts are mainly removed by needle aspiration. In that case, hydatid fluid is initially aspirated from the uppermost part of the cyst to decrease the intra cystic pressure. A great caution is made when taking off the germinative membrane to avoid contaminating the neighboring tissue. The residual cavity is sterilized by scolicidal solution (hydrogen peroxide, povidone iodine, hypertonic saline) according to the choices and habits of the surgeon. In case of vertebral localization, complete in-bloc resection was performed with the cysts and the affected part of the vertebrae trying to pass into healthy tissue. In costal location, partial resection of the affected parts was performed. After removal of remnants of germinative membranes of complicated cysts, the residual cavity is carefully cleaned and re-examined to eliminate the risk of daughter vesicles. Postoperatively, all complications were reported, and it was specified if the patients received antibiotics/albendazole or not. Mortality was taken for those who died 30 days after the operation (or during the hospitalization). After surgery, all patients were supervised in the outpatient department. The rhythm of follow-up was as follows: the first consultation was one month after the surgery, the second two months later and then every six months during the five years. Each time, the control includes a full clinical examination, a chest radiography and, if necessary, a CT scan or MRI focalized into the operated area. Any recurrence, secondary complication or the occurrence of another hydatid disease were reported. Thirty two patients with chest wall hydatidosis were identified and operated on at least once in the cardiothoracic surgery department. The patients demographic data are outlined in Table 1. Six patients (18.7%) with surgical history for hydatid cyst and had been admitted to the department for a chest wall development of the parasitosis. Three patients (9.4%) had a history of visceral echinococcosis: two were operated for lung cyst and one patient was treated for the association of a lung and liver cysts. The remaining three patients had undergone an operation for parietal hydatidosis in another institution and were treated in the cardiothoracic surgery department for recurrence at the same site. The first and the second groups were operated for costovertebral localization eight and ten years before, respectively, and the third group was operated for a cyst of the fifth right rib and it recidivated after four years. The most frequent symptoms consisted of chest pain. The association of chest pain and parietal mass was observed in four cases (12.5%). Four patients with cough and hemoptysis had pulmonary localization associated with parietal hydatidosis. Other symptoms reported in three cases consisted of respiratory distress with left atelectasis, right cervical swelling and dysphagia, dysphonia and neck compression with a supra-clavicular mass. Three patients reported neurological signs (in their personal history or at their admission in the department) and a costovertebral invasion was noted in all these cases. Two of them, with a history of vertebral hydatidosis, had spinal cord compression with transient paraplegia that recovered after laminectomy or osteosynthesis, and the third one reported paresthesia at the right upper limb secondary to hydatid cyst of supra clavicular region. On the other hand, in the asymptomatic patients the diagnosis was suspected on a radiological exam for another disease or during their clinical monitoring for other pathology. The most common location of the cysts was costal (23 cases, 71.8%) (Figure 1). Vertebral localization was observed in 10 cases associated with a rib’s localization forming after a costovertebral presentation (31.3%) (Figure 2). The chest wall muscles were involved in four cases (12.5%) (trapezius and subclavius muscles, omohyoid muscle and the major pectoralis). The muscular invasion was isolated in all cases without any other location. The cysts developed in the sub-cutaneous tissue in three cases (9.4%) and in the sternum (manubrium sterni) in two cases (6.3%). In one patient, the sternal attempt was a recurrence of a primary sternal hydatidosis. A, chest radiograph; arrow shows the cyst effect on ribs; B, scannography image; C, D; position of the cyst relative to the adjacent structures in MRI. A, B, localization of lesions in spine; C, osteolysis of the 6th right rib, transverse process, and vertebral body (arrow); D, presence of hydatid vesicles in the intervertebral foramen (interrupted arrow). The 32 patients with hydatidosis were resected through a posterolateral thoracotomy in 20 cases, axillar incisions in three cases, paravertebral incisions in two cases and supra-clavicular incisions in three cases. Sternotomy was used as a median in one patient. The Paulson incision was performed in one patient who presented a simultaneous mediastinal, pleural, diaphragmatic and first costal localizations. The cyst aspects were mono-vesicular in 11 cases (34.4%), multi-vesicular in 13 cases (40.6%), multiple locations in 5 cases (15.6%) and infection in 3 cases (9.37%). The surgical procedure consisted of a solely rib resection in 13 cases (eight, three and two patients had had a resection of respectively one, two and three ribs with corresponding intercostal spaces; the mean number of resected ribs was 1.53) and none had prosthetic reconstruction material (Table 2). A costovertebral resection was performed in 10 cases (a rib resection associated with transverse process, vertebral body, or with both in respectively three, four and three cases). The other procedures were partial resections of the sternum in two cases and cystectomy with resection of parietal soft tissue in nine cases. Another team of surgeons (orthopedists) collaborated with the study team in eight patients (for the resection of transverse process in one case, resection of vertebral body in four cases and both in three cases). After surgery, one patient who had an extensive resection (from the 4th to the 6th rib with the corresponding transverse processes, drainage of the vertebral canal and resection of the corresponding vertebral bodies) died after an acute respiratory distress syndrome and refractory hypoxia on the 12th postoperative day. Four patients (12.5%) had postoperative complications consisting of paraplegia secondary to spinal cord compression with T7 sensory level with pulmonary embolism, hemiplegia with bilateral amaurosis recovered after 12 days, hemodynamic instability for 48 hours, and one case of wall abscess. None of the patients had air embolism following the use of hydrogen peroxide. All the patients treated surgically were reevaluated, after a mean follow-up time of 22.8 months ranging from 1 to 135 months. The outcome was favorable for all the followed up patients treated by radical resection except two patients (6.2%) who developed a recurrence. The first patient who was operated for a costovertebral hydatidosis, after twelve years he developed three costal localizations. The second patient had a hydatid cyst of the manubrium sterni and had a relapse after eleven years. No recurrence was observed after the second surgery. Totally, in all cases of costovertebral recurrences (including patients who underwent operations in other departments), 5/10 patients had a local recurrence of hydatid disease. On the other hand, in the patients who underwent operations in the cardiothoracic surgery department, only 1/10 patients presented recurrences. Nine patients (28.1%) received anti-parasitic drug (albendazole, 400 mg/day for six months) after surgery. During the follow-up period, only one patient presented a recurrence following a surgical resection for a costovertebral hydatidosis. He was re-operated after 10 months. To the authors` best knowledge, few studies focused on parietal thoracic locations of the hydatidosis in the English literature. Most of these works highlighted either a single chest wall location of the hydatid disease (vertebral, costal, or soft tissue) or a hydatid invasion from a radiological point of view (non-surgical) (3-7). In most cases, the clinical symptoms were non-specific and misleading. The most reported signs were usually chest pain or the appearance of a parietal mass especially in patients who underwent operations for visceral hydatidosis. In contrast to the invasion of the chest soft tissue, which can be revealed by apparent parietal mass, bone hydatidosis, especially with spinal involvement, is uncommon and remains asymptomatic for a long time. In symptomatic cases, malignant disease is often suspected (8, 9). The diagnosis should be suspected when dealing with patients from rural areas or with a history of hydatidosis. Rarely, a complication such as spinal cord compression, neurological deficit or rib fracture may reveal the disease (2). In the current study, chest pain and the appearance of a parietal mass were the two major signs observed in costovertebral locations. 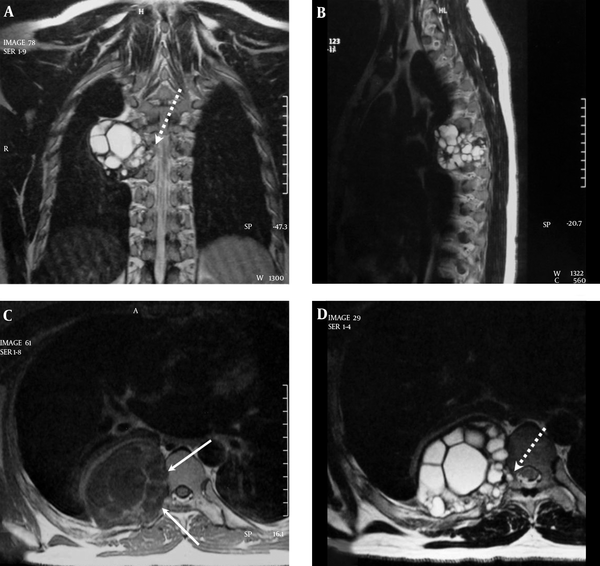 The discovery of a supra clavicular or axillary mass (considered as unusual localizations of primary hydatid cyst (10, 11) with soft consistence) was a revealing sign for intercostal or soft-tissue cysts. Some clinical signs were observed reflecting advanced diseases such as paresthesia, dysphagia, dyspnea and dysphonia. Neurological signs are usually reported in cases with extensive vertebral or costovertebral hydatidosis (2). In some cases, the development of the chest wall cyst can be completely asymptomatic. Indeed, in the current study, 15% of patients had no complaints and showed no symptoms. CT scan remains a standard procedure highlighting bone location of parasite cysts; showing cystic images inside bones redrafted by the disease (1). It is also an excellent technique to assess the degree of bone expansion (12). Currently, MRI is gaining more ground especially to evaluate the relationship between the cysts and the adjacent structures. Some studies consider that MRI is mandatory in cases with involvement of the posterior vertebral arch. The most specific findings consist of a hypo-intense T1 image and a hyper-intense T2 that does not take the contrast in the periphery except in rare cases (1, 12). Thoracic ultrasound examination is indicated to study soft tissue. For bone localizations with soft tissue damage, this technique may be diagnostic. However, it is unable to assess the bone or the intra-ductal extension. Fluid collection with membrane peeling or fluid-tone compartmentalized cystic image is the typical feature of a hydatid cyst (6). Surgery is the mainstay treatment for E. granulosus cysts. The surgical techniques depend on the involved parts or components of the chest wall, the localization or the presence of complications. Hydatid cyst of the soft parts of the chest wall can be resected using techniques similar to those of the treatment of liver or lung cysts and consist in aspiration of hydatid fluid, careful removal of the hydatic membrane to avoid the contamination of adjacent tissue and sterilization of the cavity (with hydrogen peroxide, hypertonic serum or povidone iodine as used in the current study). None of the current study patients had an iatrogenic gas embolism (13). Sometimes, the removal of the whole pericyst is necessary. In costal involvement, the best surgical treatment is, according to many teams, the complete surgical excision of the invaded ribs (8, 12). This treatment requires a resection of the entire reached area containing hydatidosis by cutting the ribs in healthy parts away from lesions. In case of extended resections, the use of a prosthetic material to fill the bone defect and restore the chest wall shape is required. The treatment of costovertebral invasion is not as obvious as the previous locations. Indeed, authors believe that it is difficult to treat vertebral hydatidosis. Indeed, surgical resection may be insufficient dealing with local recurrence (3). The high risk of recurrence in the current study was 50% of the cases, and neurological complications make the therapeutic decision delicate. Collaboration between the thoracic surgeons and specialists in spine surgery is necessary to deal with this unusual localization. Cysts can be removed by a resection of the invaded vertebral body (14). Osteosynthesis may be necessary, especially in case of removal of several vertebral bodies (two or more) and/or transverse processes to fill the defect and especially stabilize the spine. The hydatid parasite behavior is very aggressive and frequently leads to significant and widespread bone dilapidations that mimic a malignant pathology. The limit of infected bone tissue by the parasite is sometimes not visible during surgery; this needs an extended resection of the vertebrae or ribs to prevent recurrence, since the simple removing of macroscopically pathological bone may expose the patients to a high rate of recurrences. However, this intensive treatment may require several operating times (laminectomy, vertebrectomy, rib resection, osteosynthesis) and several approaches (posterior incision, thoracotomy, etc.) with one or more uses of anesthetic. The risk of recurrences and complications depends on the localizations. In vertebral localizations, postoperative complications are similar to those observed after any spinal surgery. On the other hand, for isolated costal and soft parts localizations, the risk of recurrence is very low approaching 0 in the current study. In contrast to the literature findings, in the current study recurrences were only observed in cases of costovertebral invasion (five recurrences were reported for a total of ten patients with a costovertebral hydatidosis). This could be due to incomplete or limited resection based on the ignorance of the real extension of the damage that can be undetected by imaging. Therefore, patients undergoing operations for this type of localization should be regularly tracked by spine CT scan and/or MRI over a minimum period of ten years. In case of spinal recurrence, treatment can be challenging due to its complexity and the absence of consensual rules (revised spine, presence of osteosynthesis material and accumulated resections). Medical treatment based on albendazole proved its efficiency to treat hydatidosis. It is mainly used in cases with a high recurrence risk, especially in cases of bone invasion and particularly vertebral ones (15). Albendazole may be used to prevent per-operative contamination of the surgical site. In the current study, after treatment with albendazole, only one patient had a recurrence among the nine patients treated, which is a significant result. The chest wall localization is rare in the hydatid disease. It can be isolated or associated to a visceral involvement (liver and lung). In the costovertebral localization, this parasite behaves locally mimicking a bone malignancy. Surgical treatment is a mainstay and resection should be as radical as possible to avoid recurrence. Authors’ Contribution: Study concept and design, analysis and interpretation of data, critical revision of the manuscript, study supervision: Mohamed-Sadok Boudaya and Mona Mlika; acquisition of data and drafting the manuscript: Zied Chaari and Hazem Zribi; administrative and technical support and study supervision: Samira Aouadi, Adel Marghli and Tarek Kilani.